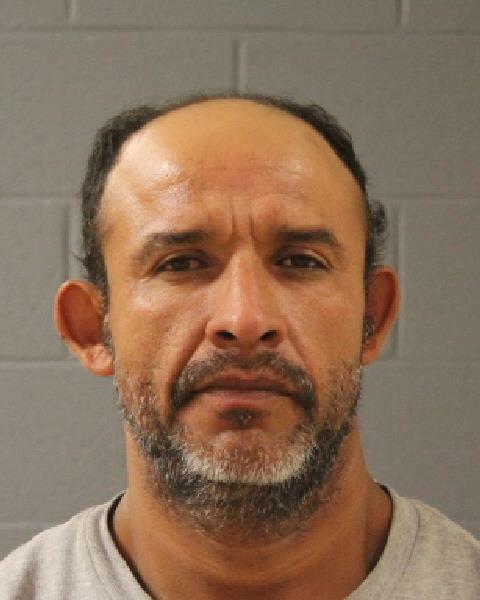 ST. GEORGE – A St. George man has been charged with three felonies after a family that had been out of town for three weeks returned home Sunday to find their home broken into and several items missing – including a recently installed kitchen sink. Jose Ramos, 43, was booked into the Washington County Purgatory Correctional Facility on charges of criminal mischief, theft and burglary. He is scheduled to appear Tuesday in 5th District Court before Judge Eric Ludlow. According to the arrest document, the family reported someone had been in their home and “tore everything apart and stole a lot of property.” Items kept in a shed behind the home had also been stolen. Responding officers also noted extensive damage to vehicles, which had items stolen from them as well. Officers also found a partial shoe print left in the dust on one of the vehicles’ floor mats. Inside the home, pictures that had been on the wall had been taken down and left on the floor. Vents, towel racks and other items attached to the wall had also been ripped off and were missing. Among other missing items were a recently installed kitchen sink and the garbage disposal that had been attached to it. “A window in the master bedroom was broken, allowing the suspect access to the residence,” the arrest report states. The cost of the stolen property and damage to the home and vehicles was estimated to be over $5,000. Family members who were asking around the neighborhood about the burglary noticed a couple of nightstands in a neighbor’s carport that resembled ones taken from their home. St. George Police officers went to the home and made contact with a woman who said Ramos was the one who had acquired the items. The woman told officers that Ramos has been showing up with the items over the last few weeks. When interviewed by police, Ramos’ story about how he acquired the items changed several times. “Jose initially advised he purchased the property from a friend,” the officer wrote. Ramos then said he bought the items off the street, at a yard sale and then from a man in the parking lot of the Smith’s grocery store. Ramos offered to take the officers to home of the person he said he bought the items from, but when taken there, he said he didn’t know where the man lived. During the investigation, officers matched the shoes Ramos was wearing to the partial shoe print found in one of the cars. That, along was inconsistent statements to police and the majority of the missing items being located at his residence, resulted in him being taken into custody. You can only hope someone who is such a piece of excrement can use the excuse: “I was doing it all to buy meth”. Really, he stole the kitchen sink? Can you actually go any lower? Would be interesting if the popo would release the immigration status of creatures like this as well. And he stole the rims too–was he actively trying to fulfill a stereotype? Not only that. This piece of excrement is a nitwit. Left items he stole right out on the curb in the same neighborhood… Just a true gem of a human, this one. boy oh boy. he stole towel racks right off the wall, so he prob took the rugs too. He isn’t a meth-head. He was doing it to get money for an ear trim. I was thinking a hair transplant and maybe some cosmetic facial surgery but then, what the ____ll. how ’bout a brain transplant. he probably even stole the food from the cupboards, fridgle, freezer, etc. A true gem. hahaha. I gotta say, if he wasn’t high on meth, well, what excuse is there? He was caught trying to snort the paint off the living room wall……….